This unique product fits to most single speed or hub geared transmissions. It requires no special brackets on the bike and fits in seconds without tools. It will keep your transmission and your clothing clean, thus reducing maintenance requirements and prolonging the life of your chain and sprockets. No hub gear commuter is complete without one! Please click here for important information before purchasing this item, this product is in no way recomeneded or endorsed by Thorn Cycles. NOTE: Not compatible with Rohloff's Splined Sprocket Carrier equipped hubs. Only compatible with threaded sprockets. The Rohloff model has more space in the rear fitting to clear the hub. Needs a thin steel chainring to avoid front rub. Cleared the chain stay, but clashed with the brake stay, forcing the end over so took a round Surform to the chainglider and made a channel to allow it to sit vertical alongside the brake stay. Taped over the hole! Silent in use once I tensioned the chain properly, a loose chain rubbed with a 'derailleur purring' sound. Bought this for my wife's Thorn XXP and fitted. The rear part will not go on because the Red Pip (can't see any need for this) fouls the upright in the rear frame triangle and bends the guard making it almost impossible to turn the pedals. Even without the pip the level of friction is unacceptably high so I took it straight off again. The design is ingenious cos it's a geometric challenge to make a chaincase which needs no frame attachment. Hebie rise to the challenge, and the result is a success. Ok, it adds friction to the chain-run, but you can't have everything and the friction is just the chainglider gripping the chainwheel, ie plastic on metal so it's "harmless friction". And it's great being able to grab the chainstay when you're carrying the bike up steps - look, clean hands! Took a while to get fitted, no instructions supplied. Required the splitting and re joining of the chain to allow guard to be aligned. Had to remove approx 2.5 cm from the end of guard as too long for chain stays causing guard to rub aginst rear sprocket. But once fitted and end cap secured in place it looks perfect and performs without fault. Please could you suggest a suitable 110BCD, 5 arm, 42T chain ring that will fit this chain glider? I bought a Thorn 42T chain ring when I bought the chain glider in nov. '16 which has since been worn away on the edge by the plastic of the chain guard. Is the stainless steel Surly 42T ring thinner. IIRC Hebie state that their Chain glider is suitable for a chain ring thickness of 3mm. I am not very happy as my Thorn chain ring now looks terrible and I bought the Hebie and Thorn chain ring at the same time from you. Please advise. The Surly chainrings are 2.5mm thick and should be suitable. How do I get this to fit? I'd really like to try this out but I'm not sure if it will fit my Rohloff 16T - 40T chainring set up. As far as I am aware, as listed, this will not fit a 40T but only 38T. The Reply Below Mine Says Chainglider Incompatible. I apologise for the incorrect information provided in my previous response, the forum is run by a different department so any information within it usually does not make it to us. I was merely commenting based on what we get come through the parts sales/returns side of the business rather than the Thorn bikes side of the company. 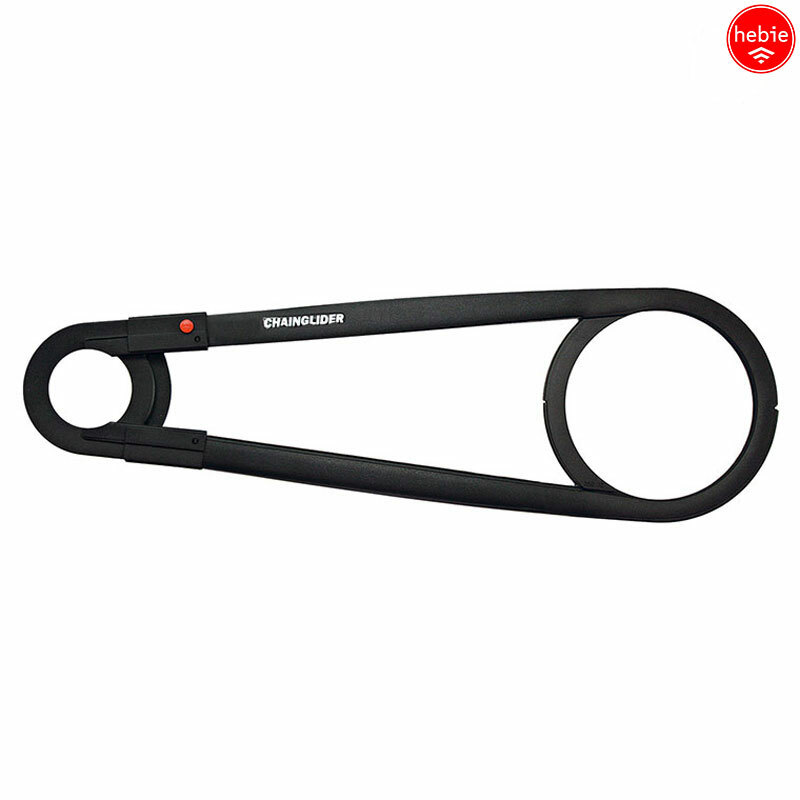 I recently purchased a new Hebie Chainglider as a replacement for one I have used for 5 years. Unfortuneately I purchased the 38T version instead of the 42T version I had. So I either have to replace my chainring or return and/or buy the correct Hebie. The current chainring is quite worn after having been used for 5 years, so I am therefore looking for a BCD130mm 38T chainring. I have been looking at your web sites, but haven't been able to find one. Do you have one to recommend. I have previously tried a Thorn 7075T6/42T. That chainring was to thick for the Hebie chain guard. The chainring therefore need to be thinner that this one. I'm afraid the only chainring that we will have in 38T in the Rohloff compatible 3/32" chain size is our own Thorn ring. Most 3/32" chainrings will be this thickness.